I need a new smock. Something appropriate to the dress styles I want to recreate from 1485-1515. I skimmed the books I have available and found that I really like the square-necked smock showing in The Queen’s Servant’s (p. 36). It turns out that this is also the same style as a smock shown in Patterns of Fashion 4 (item #75 pgs. 57 and 115) identified as belonging to Mary, Queen of Scots. Added bonus, the rectangular construction used in the PoF4 smock is spot on with the pattern I’ve been using for rectangular tunics cut to fit my body shape (ie, cut more narrow in the shoulders). – created using 38″ wide fabric. The selvage is used in the construction. I cannot find 38″ wide white linen fabric so I’ve decided instead to cut 60″ wide fabric down to the width needed and hem the edges. – there is no shoulder seam. The body portion is made from one piece of fabric. – pieces are connected with an insertion stitch (also called faggoting). The images aren’t terribly clear but it looks like an interlaced herring bone stitch. The connection points are directly across from each other (not off-set) and the twining forms a somewhat bulky cross in the opening between the fabrics. 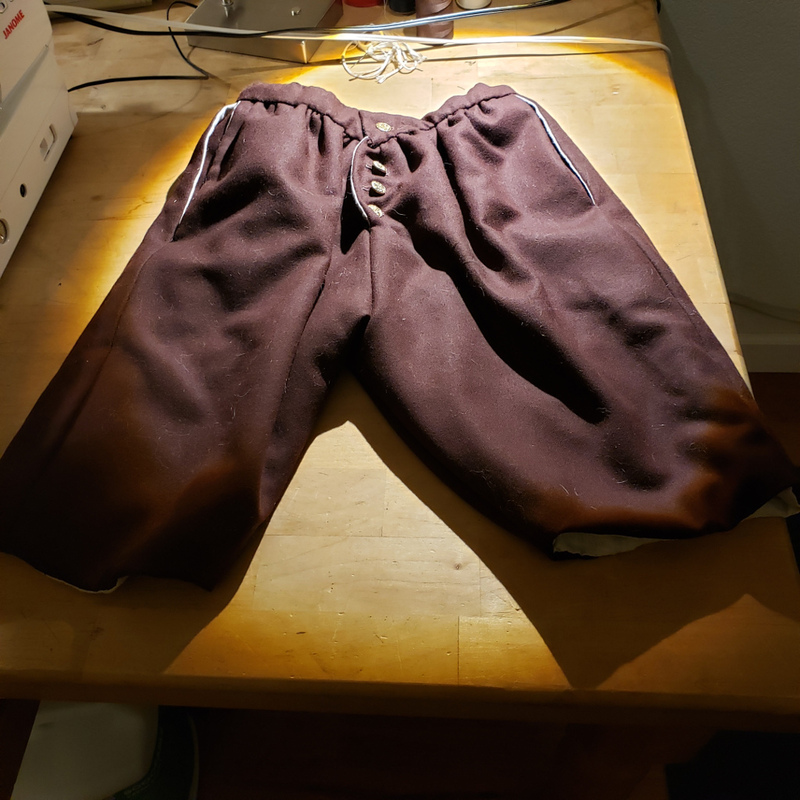 – the sleeves were cut from one piece of 38″ fabric that was split down the middle (giving a selvage on the front of each sleeve). I don’t have access to 38″ wide fabric AND I’m big so I have increased the width of the sleeve. – It appears that the gores on the original were made from the off-cuts from the upper portion of the body. – If the neck opening is cut as one piece it would be possible to make the gussets from the fabric removed from the neck opening. – the lace around the neck and wrist seems to have been recycled from a different garment(maybe a collar?). 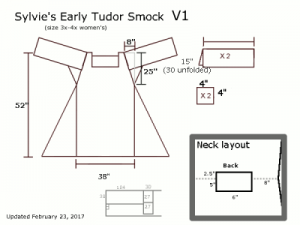 At this time I plan to sew a smock without lace. The original from PoF4 is noted as belonging to Mary. 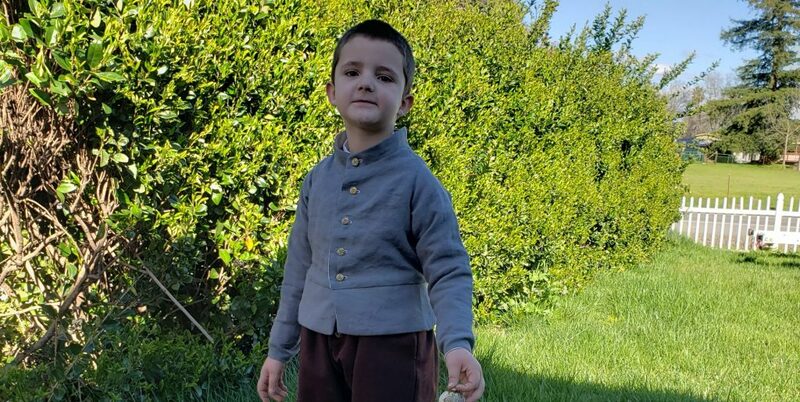 It’s doubtful that this is something she was wearing when she was beheaded since there are several sources that note that all of the clothes Mary died in were burned after her beheading. I’m still digging to see if I can find out more of the provenance of this garment. 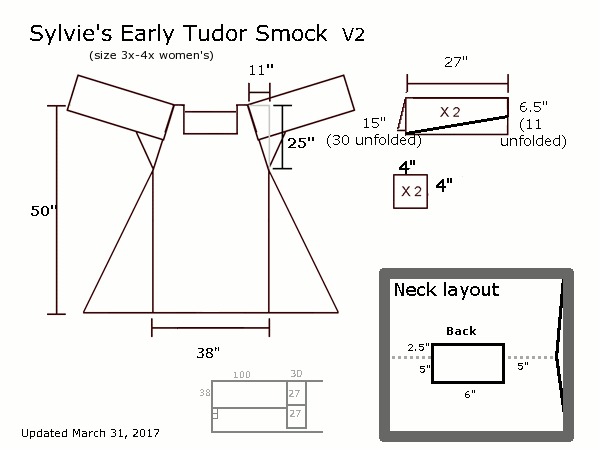 I’ve included the measurements I used to create a smock for me. This is slightly adjusted from the original (shorter in length, wider in the arm, excludes the cuff on the end of the sleeve, tapered the sleeve, more narrow at the shoulder, excludes the lace at the neck and wrist). It’s not as efficient at fabric usage but it does fit me. If you had smaller arms then the sleeves of the garment could be made from the ~22″ offcut left when the body piece is cut out. 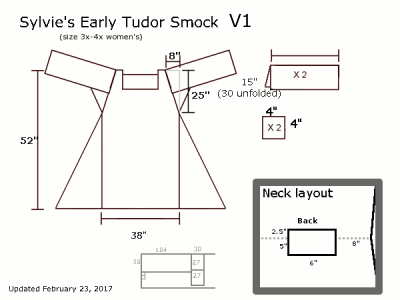 The pattern for the smock is found in Patterns of Fashion 4 (item #75 pgs. 57 and 115). The book includes a lot of very nice closeup pictures and a measured drawing with construction notes. 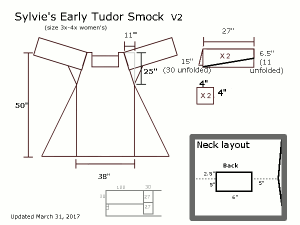 I’ve decided to do this smock in two phases. Phase 1, make a smock and use flatfelled seams. This allows me to quickly have a smock to use and easily test out the fit and find any issues before I dump a lot of time into this project. Phase 2, make a smock and hem all the edges of all the pieces and use the insertion stitch to connect the pieces. First iteration. Decided this was too long, the seam between sleeve and garment was too far down the arm and the sleeves were too wide at the wrist. Second iteration. Tapered the sleeve too far, changed my mind and decided I’d like it better if I could roll the sleeves. The back of the neck is very high. I may change that. Not sure yet. I made up a first version of this using flatfelled seams. I didn’t like where the seams for the shoulder hit so I made that triangle bigger (v1 -> v2) I also narrowed the ends of the sleeves. It turns out I narrowed the sleeves too much and now I can’t roll them up. I don’t love that and will be doing the sleeves on future smocks much wider (8″ folded, 16″ unfolded at least)(v2-> v3). This works for trying out the pattern so I’m ready to move on to Phase 2. 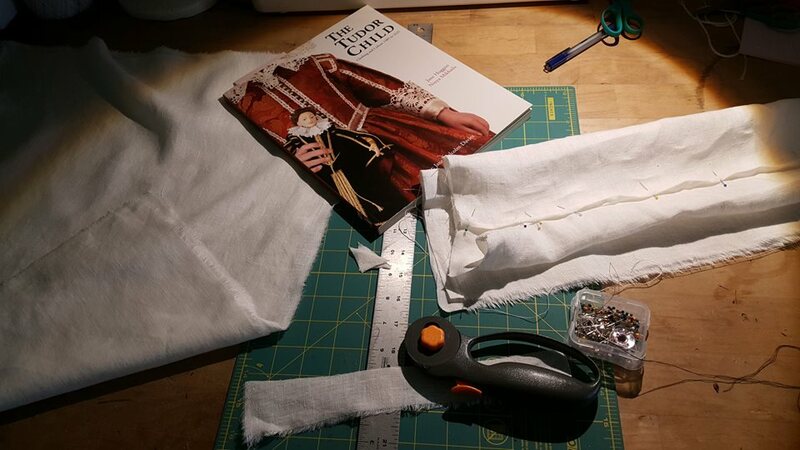 Arnold, Janet, Patterns of Fashion 4 – the Cut and Construction of Clothes for Men and Women c. 1560-1620, London: Macmillian, 1985. Print. Johnson, Caroline, The Queen’s Servants: Gentlewoman’s dress at the accession of Henry VIII, United Kingdom: Fat Goose Press, 2011. Print.